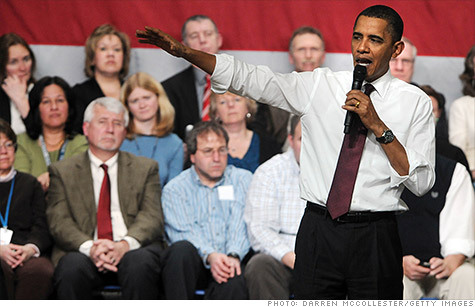 There's a lot in store for small business owners in President Obama's health reform law. They should keep a close eye on the upcoming Supreme Court decision. NEW YORK (CNNMoney) -- The health reform law is chock full of new rules and benefits for small businesses -- and all are now on the line at the Supreme Court. The 2010 Affordable Care Act includes everything from a different way to shop for insurance to a tax credit that rewards employers for insuring workers. The Supreme Court's decision on the law's constitutionality is due out later this month, even as soon as Monday. Generally speaking, there are three main possible outcomes: Health care reform could be upheld entirely or struck down entirely, or the court could do away with only some provisions. There are so many facets to the law that even partial survival could yield some benefits to entrepreneurs, such as the tax credit. That's why John Arensmeyer, who leads the pro-reform group Small Business Majority, said striking down the whole law would be a nightmare. "All the benefits will go away," Arensmeyer said. "We'll be thrown right back into the unsustainable system we've had to date." If the justices elect to keep some parts, while knocking down others, the 906-page law could become even more confusing than it is now. Here's a list of key provisions -- and what could happen to small businesses if they're maintained or discarded. If one or more workers turns to the government for help buying insurance, the company will be assessed a penalty of at least $40,000, depending on the size of its workforce. If this provision vanishes, there's one less rule for small businesses to worry about. But the rule affects 200,000 small businesses, a tiny fraction of the nation's approximately six million employers. More than 96% of small businesses fall below the 50-employee threshold. iReport: Have you been denied health coverage? If the mandate disappears but the 50-plus employee rule stays, insurance costs could skyrocket for small businesses who will be forced to provide workers with insurance. Exchanges: Starting in 2014, companies with up to 100 workers will have the option to buy lower cost health insurance through employer-only exchanges set up by the states. They're called Small Business Health Options Programs, and these exchanges are intended to bring down the cost of health care for small firms. They will make it possible for business owners to compare similar insurance plans -- just as consumers shop for other services. They also could help small firms by allowing them to effectively add their employees to a much larger pool of insurance customers. The federal law ordered states to create them, and a dozen have already started. Striking down this provision wouldn't necessarily stop states from creating exchanges. But it would do away with federal grants helping them do so, making the process more difficult for some, impossible for others. Tax credits: Since 2010, some small businesses have received tax credits rewarding them for providing workers with health insurance. Eligible companies must have no more than 25 workers and pay average salaries of $50,000 or less. Losing the tax credits would mean no more help from the federal government, which averaged $2,700 last year. But it has turned out to be an underwhelming tax credit. Employers say applying for the credit involves a lengthy, complicated formula that sometimes yields very little financial help. Only 170,300 companies received it last year for tax year 2010, even though the government estimates between 1.4 million and 4 million are eligible. The 80% rule for insurers: Since 2011, insurance companies have been required to spend at least 80% of every dollar on medical care and not administrative costs -- or refund the difference. This rule, known as the medical loss ratio, is especially important for small businesses. Administrative costs typically have taken up a much larger chunk of small companies' insurance costs when compared to large companies. The rule has already been shown to work, at least in California, where 4,400 companies received $3.5 million in refunds from insurance company UnitedHealth this month. UnitedHealth was forced to return the money to comply with the 80% rule. Eliminating the ratio would drive up insurance costs for many small companies. Have fears of losing health insurance held you back from quitting your job to launch a business? Email Jose Pagliery and share your story. Click here for the CNNMoney.com comment policy.